A more down-to-Earth GX700. Take away the water cooling capabilities of the GX700 and you're left with a lighter and wholly capable system in the form of a G701. While performance is where we expect it to be for a high-end gaming machine, the system still suffers from many of the same drawbacks as its ROG series siblings. 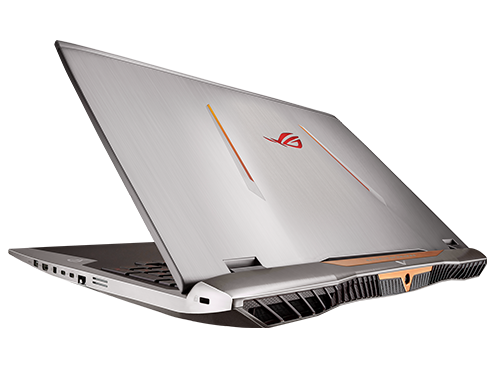 The ASUS G701 is loaded with extremely high-end hardware. In almost every aspect, it's a direct competitor to most custom desktops. Its CPU is a top of the line mobile Intel Core i7 with overclocking support. Our unit came with 64GB of DDR4, a 1TB Samsung SM951 RAID 0 array, and an NVIDIA GeForce GTX 980M with 8GB of VRAM. The G701 is the crème de la crème of high-performance mobile notebooks, and can handle pretty much everything thrown its way. Positive: Impressive design; high gaming performance; powerful hardware. Negative: Heavy; mediocre speakers. NVIDIA GeForce GTX 980 (Laptop): Overclockable laptop graphics card based on the desktop GTX 980. Performance depends on the cooling solution and power supply. These graphics cards are able to play the latest and most demanding games in high resolutions and full detail settings with enabled Anti-Aliasing. » Further information can be found in our Comparison of Mobile Graphics Cards and the corresponding Benchmark List. 88.2%: This is a good rating above average. Nevertheless you should not forget, that 10-15% of all notebook-models get a better rating.